Before the holidays, a team member brought in a little square plastic box filled with red cards. It was purchased from Crate and Barrel. Each card had a question that make an interesting conversation starter. Done talking through one question, grab another card. We started kidding about it in meetings that where going slowly. But, many of use started finding ourselves bringing up the questions again when hanging around with friends off hours. Looking around, we found a iPhone app had a few question cards, sort of a developer’s first attempt at replacing the paper cards with an electronic solution. Then, at the end of January a new app showed up that took on the little plastic box of cards with a real solution. 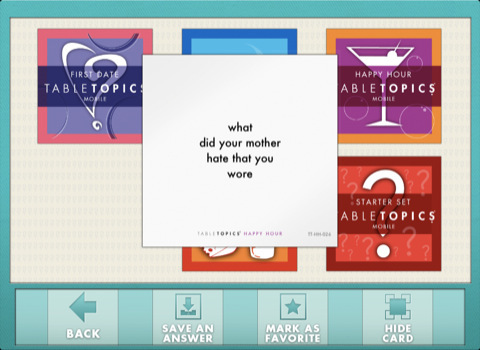 TableTopics HD for the iPad comes with two decks of 60 cards each: Starter Set and Happy Hour. Pick a deck and start flipping ‘cards’. You can answer to save for later as well mark cards as favorites. Other decks like First Date, Go Green and In Flight are available for in-app purchase. TableTopics HD will let you pull cards from multiple decks to mix up the questions. If a question creates a new question in your mind, you can create your own cards too. TableTopics HD is not a universal app so you have to buy another copy for your iPhone. The iPhone version, TableTopics, is a dollar cheaper. The actual card decks through the in-app purchase option are the same price for both versions.